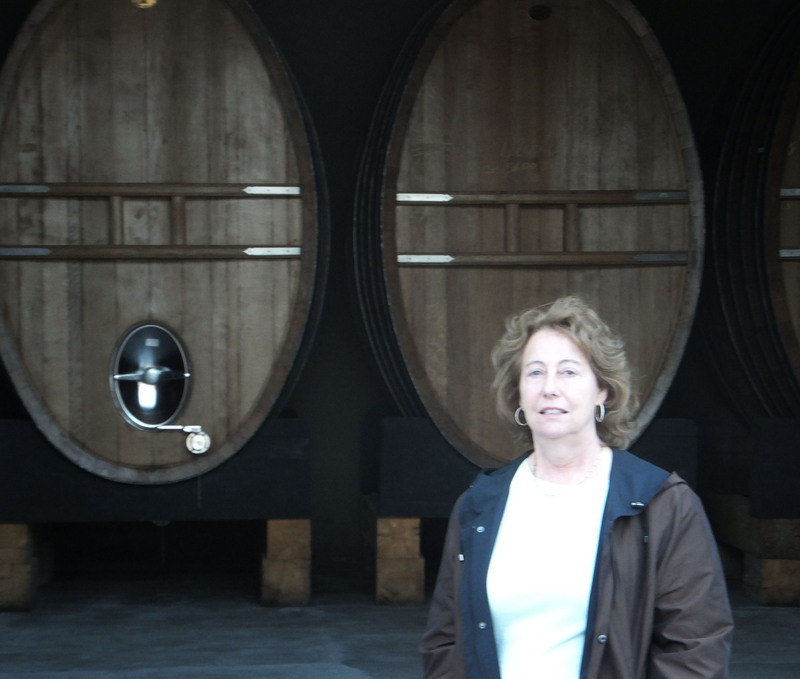 I am a mostly retired attorney who, along with my husband Charlie, have had the good fortune to visit many wine regions around the world. Charlie and I have tasted some great wines on our journeys, but more importantly, we have met many wonderful people and had some great and funny experiences. Trying to find Schramsberg on our first visit to Napa, I walked down a driveway and asked the man standing at the end of the drive if this was the place. He said no, but invited Charlie and me for a tasting of his wines, shared his story, and then told us about Robert Louis Stevenson’s visit to the area (Stevenson wrote about his visit in both Silverado Sketches and The Silverado Squatters). Our tasting included his commemorative bottlings in tribute to Stevenson. The winery doesn’t exist anymore, and I don’t remember the gentleman’s name, but this was the type of warm welcome we have always received during our wine journeys. Visiting and tasting Spottswoode wines with Mary Novak near the startup of Spottswoode, then many years later meeting with her daughters Beth and Lindy who are now very active in the business, was memorable. Meeting and visiting with Michael Seresin of Seresin Estate in New Zealand, and learning of the origin of the “hand” on his labels, was unforgettable. Having lunch with Copain’s Wells Guthrie at Mirepoix, with him bringing a number of his wines for us to taste, is a fun memory. Meeting Joey and Jeff with Poem Cellars (now Gentleman Farmer Wines) by striking up a conversation with them at a Napa restaurant, and then being invited to taste their wines in their home, was incredible. Having David Del Dotto enthusiastically show us his wines and the influence of different types of barrels was remarkable. Meeting Jim Prosser and seeing the Norse “soul boat” at J.K. Carriere, listening to Peter Rosback of Sineann passionately talk about the different types of closures for his wine, and then buying cases of pinot noir (even though I am not a fan of pinot noir) because Charlie and I had such a great time in the Willamette Valley. Having Fred Constant show us his vineyards in his Swiss army jeep that he was so proud of (the vineyards and his jeep! ); tasting Cardinale and Lokoya in a trailer when the winery was just a vision; listening to Silvia Altare talk about the difficulty of women winemakers in Piemonte; meeting an older Italian gentleman at Contratto and having him invite us to his bar to show his gratitude to Americans because of the war; meeting enologist Joel Tibero in Portugal and winemaker Lionel Gourgue in Spain, and remaining in touch for years afterwards; and standing on the hilltop at Iron Horse Vineyards, with its incredible views of Sonoma County, and having them pour Terry, David, Charlie and me well over 20 wonderful wines. Having the film crew at Rosemount Estate in Hunter Valley, Australia ask to use our hands (holding wine glasses!) for the commercial they were filming at the time of our visit. These are all such good (and sometimes funny) memories. So this blog is to share our experiences and pictures, so you can travel along. Or, give you some ideas on how to plan your own great wine journey. I loνe уoսr blog.. very nice colors and theme. Did you make this website yourself or did ʏou hire someone to do it for you? Thanks for your comments! Yes, I did the blog myself using the Twenty Eleven Theme from WordPress. Whenever I have had a technical question, the “happiness engineers” at WordPress have been great. Hello there – just booked Paggio ai Santi after reading your travelogue through Tuscany. I was close to booking La Bandita Townhouse and had a feeling the reviews were too good to be true! Paggio looks like a dream and a new area near the coast for us. My wife and I are friends with Wells Guthrie as well. Thanks for your note. Let me know how you like Poggio ai Santi, and don’t forget to try La Pineta.